American lawyer; born at Albany, N. Y., June 23, 1842; graduated from Barre Academy, Vermont. He was admittedto the bar in 1863, and shortly thereafter became assistant district attorney of Albany county. In 1868 he was elected recorder of Albany, which judicial position he held for four years. In 1881 he entered into partnership with Rufus W. Peckham (later associate justice of the United States Supreme Court), and when the latter was elected to the state bench, Rosendale continued his law practise with Albert Hessberg. For several terms Rosendale was corporation counsel of Albany; and in 1892 he was elected attorney-general of New York state. Theodore Roosevelt, when governor of that state, appointed him (1899) a state commissioner of charities, in which honorary position he has since served, devoting much time to its duties. Rosendale has always manifested a keen interest in Jewish matters, not only in the community in which he has lived, but throughout the country. He was active for a long time in the affairs of the Order of B'nai B'rith, and for ten years was president of its court of appeals. 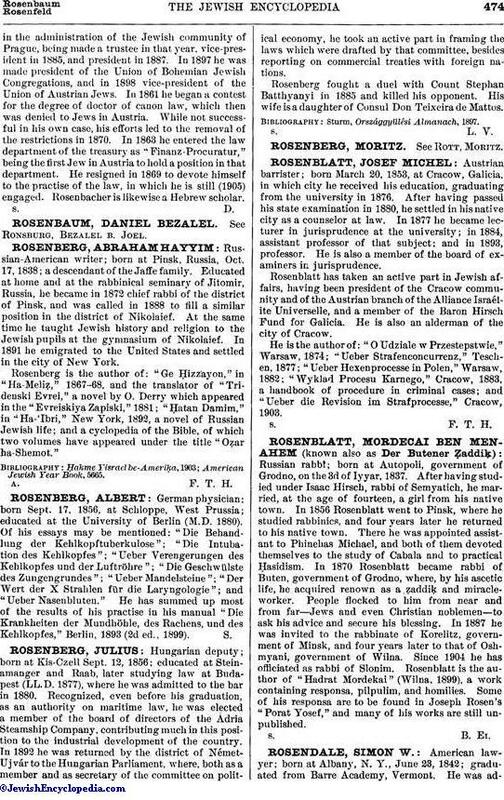 He was for a number of years a member of the executive board of the Union of American Hebrew Congregations, and frequently attended its conventions as a delegate. He has likewise been a trustee of the Albany congregation. 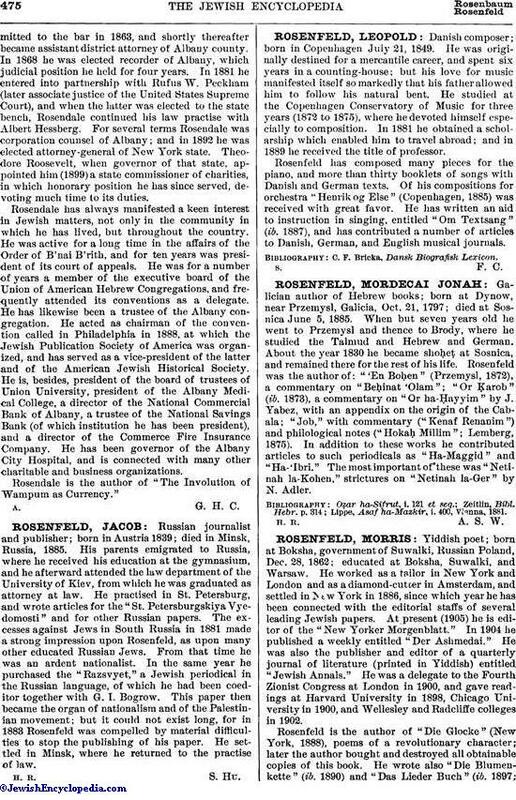 He acted as chairman of the convention called in Philadelphia in 1888, at which the Jewish Publication Society of America was organized, and has served as a vice-president of the latter and of the American Jewish Historical Society. He is, besides, president of the board of trustees of Union University, president of the Albany Medical College, a director of the National Commercial Bank of Albany, a trustee of the National Savings Bank (of which institution he has been president), and a director of the Commerce Fire Insurance Company. He has been governor of the Albany City Hospital, and is connected with many other charitable and business organizations. Rosendale is the author of "The Involution of Wampum as Currency."